HESPERIA, Calif. -- A wildfire swept across a Southern California freeway Friday afternoon, burning at least 3,500 acres and causing several vehicles to burst into flames. The blaze that broke out Friday afternoon along Interstate 15 in the Cajon Pass, the main route between Southern California and Las Vegas. Multiple ambulances were called to the scene but there were no confirmed injuries. U.S. Forest Service spokesman John Miller told CBS Los Angeles the the fire in the Cajon Pass has burned at least 3,500 acres and is moving fast. At least 20 vehicles -- including a boat, a car carrier and several semi trucks -- were completely destroyed by fire. Firefighting aircraft were temporarily grounded by drone activity in the skies overhead but water drops have since resumed, reports CBS News correspondent Danielle Nottingham. 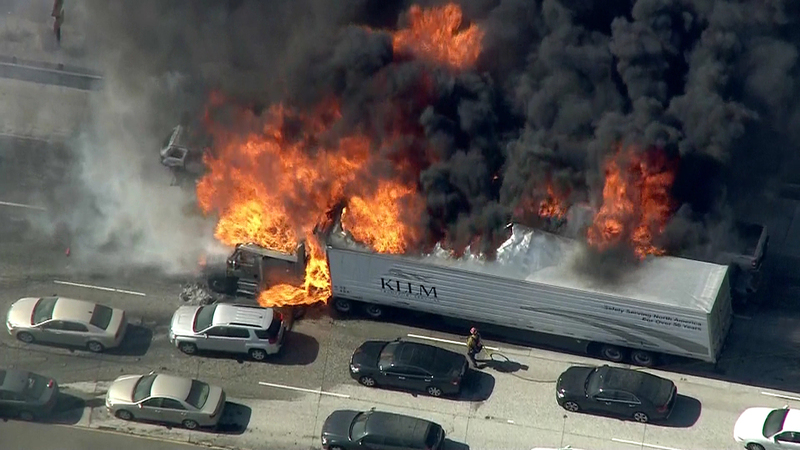 The fire led authorities to shut several freeway lanes, causing traffic to back up for miles. Fire officials initially ordered drivers to stay in their cars but many abandoned their vehicles and tried to walk to safety. Lance Andrade, a 29-year-old railroad conductor from Apple Valley, was stopped in traffic when the fire jumped the freeway and panicked people started running toward him. He also ran, but with flames all around, there was nowhere to go. A firefighter told everyone to take cover. Andrade, four other men, and two elderly women got inside the back of a semi-truck. One of the women had been separated from her family began crying, and everyone was terrified. "You could hear the explosions from people's vehicle tires popping from the heat," Andrade said. "You could hear crackling, smoke was coming in every direction, you could feel the heat. We just waited it out and prayed to God." "It was total smoke and all the cars just started to stack and the fire got closer to us, and everyone started running up the hill," said Russell Allevato, 45, of Southgate, Michigan. "Hundreds and hundreds of people running up the hill." He was traveling from Las Vegas to Los Angeles with his two teenage daughters, his nephew and his nephew's girlfriend. Their rental car was among those destroyed. "All our stuff was charred and gone," Allevato said by phone as he rode in the back of a California Highway Patrol vehicle. "It's crazy, you're watching black clouds and white clouds of smoke, there's a ridgeline off to my right... and it looks like any second flames will come over the ridgeline," Chris Patterson, 43, said from his vehicle. As firefighters gained control on the freeway, the flames spread to 3,500 acres and burned at least five homes in the rural community of Baldy Mesa. About 50 more were threatened. California is in the midst of severe drought, and wildfires are common. Some break out near freeways, but it's very unusual to have vehicles caught in the flames. The 15 Freeway was typically busy about 2:30 p.m. Friday when the fire began near the northbound lanes. With temperatures in the mid-90s and winds kicking up, it quickly ran up a hill and across the southbound lanes. Vehicles that had slowed came to a stop as the flames approached. Occupants fled. "There were elderly trying to get up the hill. People had animals, dogs. They tried to get their dogs out of the car," Allevato said. His 15-year-old daughter, Leah, cried about her lost vacation. "We waited two years for this vacation, and I saved all my money," she said. "I was thinking about it every day, and I finally got here and I have no clothes. ... I waited so long, and it's ruined."